The Telegraph reports (via AiE) that a previously unknown Bronze Age civilization has been discovered in the North Caucasus, after locating some 200 sites via air photography from the Soviet era. The Russo-German archaeological team found the sites all following a similar architectural plan, centered around an oval courtyard, and connected by roads. In some cases the foundations of the buildings retain up to a meter of their original height. The decorations and artifact styles are clearly related to the Kuban culture (axe at the left, from the Hermitage Museum), but this one is older by some 500 years, lasting from the 16th to the 13th century BCE. The sites are located rather high on the mountains, between 1400 and 2400 meters above sea level. The sites stretch from the Kuban river to the west to the city of Nalchik by the East, in the autonomous republics of Karachay-Cherkessia and Kabardino-Balkaria. While Russian and Turkic languages are now spoken in the area also, a natural thought is to imagine the inhabitants of these settlements speaking NW Caucasian languages. One detail I notice in the Wikipedia reference is that so far it was believed that the Kuban culture was derived from the, slightly older Colchian culture of Abkhazia and West Georgia, however this discovery would suggest that the opposite is true instead. This in turn may provide a frame for the migration of NW Caucasian towards the South (but notice the possible affinity with extinct Hattic), or alternatively for the arrival of Kartvelian languages maybe. It looks too recent anyhow to be related to the expansion of the Indoeuropean Hittites, which are known to have been in Anatolia since at least the 18th century BCE. This matter is admittedly complicated and surely warrants further debate in any case. 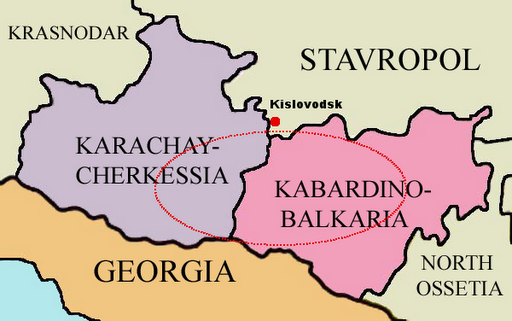 The phrasing of the relationship with the Kuban culture is significantly different (merging instead of precursor) and also the description of the area (eastern limit is said to be Kislovodsk instead of Nalchik), but I’d say that the Telegraph article seems better informed, even if it lacks images.